Today’s employee benefits and perks would blow the mind of the typical worker from 100 years ago. An on-site yoga instructor? A company that not only encourages employees to take vacations, they actually pay for those vacations? Companies that pay for employee’s eggs to be frozen? That old employee would look down at their broken hands and tired bodies, and curse at being born in the wrong period of history. It’s true. The modern American employee is in a pretty great era right now. Physical labor is declining, competition for competent employees is growing, and as a result, companies are really looking to take care of employees on a holistic level. The benefits and perks offered today are incredible. It’s unprecedented in world history. As great as it is, there’s still more to be done. Companies are still missing major opportunities with their corporate perks packages. Let’s face it, the act of working and being an employee is pretty similar at the vast majority of places. Even base compensation is within a close range across most professions. It’s hard to be different.But then there’s your benefits and perks. There aren’t many rules or standards you need to follow. Sure, most employees expect health insurance and PTO, but beyond that, the world is your canvas. Offer dog walking services, day care, free meals, meditation rooms, helicopter rides, personal oil paintings, whatever you see fit. It’s great to be quirky. Do what you like; just be sure it’s going to deliver what you want, and it has some sort of measurable return. If a benefit doesn’t solve a problem, or doesn’t somehow improve their lives, you should spend your dollars elsewhere. The good news is the most impactful, relevant benefits aren’t expensive. They involve areas of need like taking time off, saving money, reducing stress, and living healthier lives. A fountain that dispenses sweet Hawaiian Punch is awesome, but most people would be content to have a weeklong vacation free of work interruptions. Sure, you can have a menu of benefits that’s 40 pages long and full of infinite options and combinations. There’s nothing to stop you from offering 750 different voluntary benefits, for example. You’ll only hurt your own efforts. Selecting benefits is already intimidating and unnerving for many employees. Offer them tightly-focused options and packages, carefully curated and selected. Use employee feedback and suggestions when possible. Benefits and perks need to be promoted. You can't just pump them up at open enrollment then ignore them the rest of the year. And don’t think employees themselves will be aware and active. Usage matters. It isn’t enough to simply have an employee perk. Promote it, get people excited about and using it.To do so, you’ll need to think like a salesperson. But it’s worth it. Employees love to brag about their perks, more so than their level-headed managers or decent coworkers. Don’t be that company! Whether it’s PTO, preventive medical appointments, a ping-pong table, or any other benefit, guilt has no place in an office. Sometimes companies pour on lavish perks to make their workplace more palatable. If managers are tyrants, remote working can alleviate some of the pain, for example. But this is a risky path to take. In many cases, lavish perks may actually breed resentment. A better approach is to focus on practicality and solving real issues employees have. When an employee takes advantage of a corporate perk, they should be thinking of how cool their employer is - not the perks vendor. This is an old marketing principle. The positive engagement is going to go toward who and what employees see the most. As much as possible you want your company's name promoted. It's your benefit. The Company is paying for employees to have it, therefore it should be the one given credit. The company deserves that positive piece of engagement when an employee takes advantage; not some random vendor. 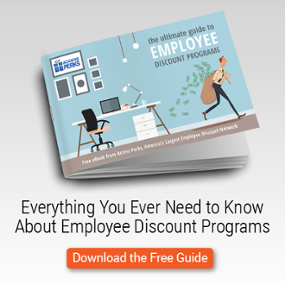 We see this frequently in the world of employee discount programs. Some providers promote their name and brand instead of the employer's, robbing that employer of the daily hit of positive engagement that is a central benefit to discount programs for employees. No matter how lavish the perk, at some point employees are going to get used to it and, inevitably, whine about it. One easy way to avert some of this boredom is modifying your employee perks on a regular basis. People freak out over change in senior management. They don’t like big changes to their core benefits, either. But employee perks? Those provide an easy, fun way to generate excitement and goodwill. Change them up regularly, but try to keep the ones that are most beloved. This is a great way to grab attention during open enrollment. Make a big deal out of what next year’s Big Employee Perk will be. Today’s workforce is different than ever before. It’s chock full of Millennials as well as not-quite-ready-for-retirement Boomers. There are also more women in the workforce, not to mention people of varying sexual preferences. Oh, and a lot of your employees may not even be on-site with you, or even in the same state. It’s tough to come up with benefits that address needs for all of these groups and their exclusive needs. Unfortunately, the days of one-size-fits-all benefits are gone. Each of these groups has specific problems and issues they could use your help with. It might be student debt assistance, fertility and parental benefits, adoption aid...things that workplaces didn’t consider 15, 20 years ago. The workforce is changing, and so must the benefits. Think of employees as consumers, in the sense that their attention spans are short and they’re prone to get bored. Employee churn will happen sometime just because people think it might be nice to try somewhere else out. One way out of this is addressing everyday problems. What can you help an employee with that they face on a regular basis? This is how your perks, and employee experience, can become unforgettable. Health insurance helps address an everyday problem but the positive return isn’t felt everyday. Find the regular sore spots - day care, saving money, learning new skills, getting in shape - and solve the problem for your easily distracted employees. Years ago, companies began adding benefits beyond paychecks to stand out in a competitive employee marketplace. That hasn’t changed. In fact, data shows the competition for talent is only getting more fierce. Your company’s benefits and perks are going to be one of the first area’s potential employees are going to look for. They’re going to be a clear differentiator to employees already in the fold who may be considering a different company. They’re worth investing in, and molding and shaping on a constant basis. It’s worth it to find something great and impactful for employees.